Kiran Nadar Museum of Art (KNMA) intends to expose people to various tracks of cultural activity and art in a variety of forms. The soul behind Kiran Nadar Museum of Art, Mrs. Nadar feels that art dissemination and art knowledge translation is something that can be leveraged to make art more accessible to the public. Keeping this in mind, Ministry of Culture and Archeological Survey of India have come in collaboration with KNMA to conduct art workshops at heritage sites and monuments, pan India that come under the direct purview of ASI. At KNMA, the aim has been to do all they can to foster the arts and culture of India. The main purpose of conducting these workshops would be to sensitize the visitors towards Indian art and culture, specific to the ASI monument sites at which they will be held. It will help raise awareness and foster interest for art in the public eye. To encourage everyone to join in, KNMA plans to organize the workshops on weekends. The Heritage Art project will begin with Delhi on January 26th & 27th at Qutab Minar and Humayun Tomb, respectively. The other cities include Lucknow, Bhopal, Guwahati, Dehradun and Shimla. 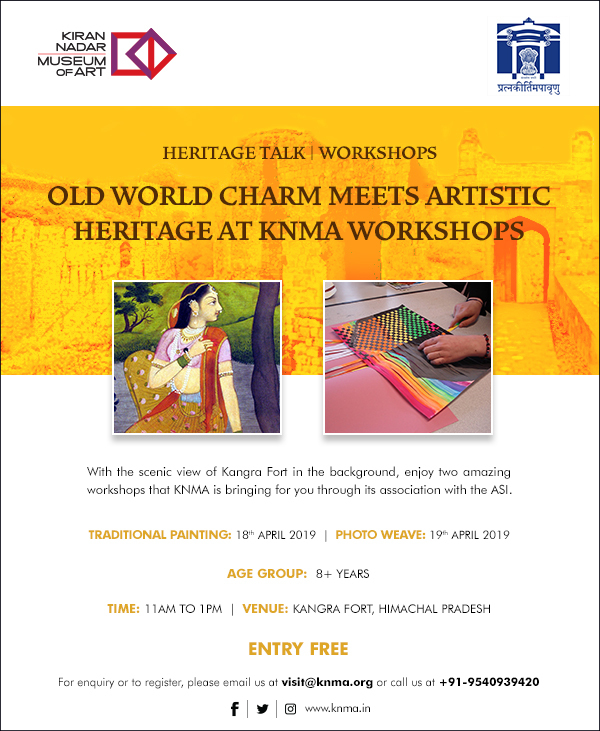 Art is anything but ‘elitist’ and KNMA aims to bridge this gap between the art and general public through their various art interactive programs like these workshops at various heritage sites throughout the nation. “The dialogue with the lay person is important, it is essential to catch interest in order for the notion of art as elitist to be dispelled. We decided on conducting art workshops to expand the reach of art to everyone by leveraging the ‘entertainment’ value of it. We want people to feel motivated to see and relate to these works. This project will be an important step towards change, and hope to help bring art and culture to people in a different and interesting manner,” said Mrs. Nadar. KNMA is plugging the lack of art promotion in the public sphere and is working towards encouraging art appreciation. KNMA aspires to become a place for confluence, through its curatorial initiative and exhibitions, school and college workshops, art appreciation discourses, symposiums and public programs. It is focused on bridging the gap between art and the public and fostering a museum-going culture in India. In order to activate the museum as a site for visual and intellectual dialogue, the museum aims to develop innovative programs that seek active collaborations from artists as well as the public. The vision of the KNMA is to instill a deep appreciation and enjoyment of art, by making it visible and accessible to the global public in a world class Museum; and to that purpose - be dedicated to provide a definitive platform for archival, display, nurturance and promotion of art from all over the world. Workshops like Tile Mosaic, Glass Painting, Clay Modelling, Tile Relief, Pen & Ink Drawing, Mask Making, paper Sculptures etc. will be taught. In a way, these workshops will help people understand the importance of these archeological monuments and their history.